For those who have read my blog since the beginning you will recall I had a schwannoma (a nerve sheath tumour) removed from my spine about 11 years ago now. I had to self-diagnose my own spinal tumour. Eventually after a 2 year battle I was finally given a MRI which revealed as I had predicted a tumour within my spine. The surgery was a great success and the tumour never grew back so all was well.....so we thought. However 6 years ago I developed pain in my ribs. The outstanding features of schwannomas is the pain they cause. Wrapping themselves around the nerves means they create intense pain. The pain is very distinctive so when I has the all too familiar pain in my rib I thought straight away "oh no not another one". The medical profession decided to ignore my self diagnosis once again and began to make their own. They told me to have one schwannoma is very very rare, to have two is practically impossible. So I have endured years of incorrect diagnosis. I have also had not one but two botched attempts at removing the lump which they said was just a harmless lipoma. I then was passed from one department to another with everyone saying "no, not my department". In the end I had exhausted all my doctor's referrals. In desperation I took to researching my condition on the internet. You can have more than one schwannoma. It may indeed be extremely rare but there is a condition called schwannomatosis which causes multiple tumours to grow throughout your body. I spent many hours trawling the internet late into the night but I succeeded in tracking down a expert on schwannomatosis. The good news is I finally have a great team of expert behind me. The bad is that my condition is genetic so there is a 50/50 chance I may have passed it onto my two daughters. Obviously I am very distressed about that possibility. They believe the lump in my rib is another schwannoma. I am waiting to find out if a surgeon with be willing to try and remove it. They also suspect I may have other schwannomas due to the severe pain I have been having in my neck, shoulder and left arm and I await further scans to see if this is the case. So what has this got to do with bikes you may be thinking? Why are you telling us all this? Well if in the future there are periods where I am not riding I do not want to explain the reasons why when I may be feeling real down so best do it now when I can still be upbeat about it. Better out then in, so they say, that def also goes for the tumours as well. Haaaa haa. My first concerns after receiving my diagnosis were obviously my daughters and whether they have inherited the condition. The second was how this could impact on my relationship with Ren because we spend most of our time together enjoying the thrill of the ride. Now - now then I am talking about the motorcycle riding here. I thought "oh s#*t how long may I have to be off the motorbike after surgery?" How will possible surgery, or the condition itself effect my ability to ride? I am also concerned that my arm is now becoming weak and this in itself may also limit my ability to ride. I actually refused the painkillers they offered on the primary grounds they could make me drowsy and therefore make me unable to ride. My bike is a huge part of my life now. The majority of my leisure time, my smile time, revolves around all things motorbike related. The thought of losing this in anyway brought a good dose of self pity to me and I admit I've had a few glum days. If my bike is my therapy then if I can not ride it what can I do for stress relief? Life will always have its ups and downs. One of the beauties of oldish age is that I now see those patterns for what they are. I also know that being sad will not make my tumours magically disappear. I know I have to now more than ever make the most of what good days I have. The pain can be relentless at times but by the grace of motorcycling angels this weekend the pain eased off. The weekend brought Ren and a much needed ride out with friends. It provided me with the therapy I sorely needed after this week's not so great health news. It brought my smile back to my face and for that I will always be grateful to what being a biker has managed to achieve for me. Riding allows me to escape my troubles and restores my spirit. Long may it continue and just in case it may not ..then let none of us miss that opportunity to get out there, make some memories and add some smile miles while we can.. Smile miles..long may they continue. Oh Sharon there have been a couple of comments to suggest you were not feeling 100% but I'm sorry to hear that news. If it comes down to good and bad days then we are in the same boat. As far as pain relief goes Tramadol 50mg works for me without interfering with riding, it is such an individual thing though. You'll have to get to your GP and after that it's trying to see what works for you. On the bike side of things if you've got weakness in one arm then I'd suggest moving the clutch lever over to the throttle side. There are some very clever twin lever systems out there. Google NABD, the national association of bikers with disability. Maybe something to consider in the future if it's a permanent thing. On the positive side at least you've given your daughters a heads up and you've got an expert team behind you now. I really hope things start looking up for you both. Really sorry to hear that Sharon but as usual I'm impressed by your fighting spirit and ability to rise above things. I hope you can continue to enjoy your riding and that the health problems can be resolved. It must be a great worry that the condition has potentially been passed on to your daughters -m let's hope they're OK.
Not good news but at least you had an inkling of what was wrong. Get your health sorted and then think about things thereafter. Their are numerous aids available for riders with disablements but no point of worrying about that unless that's the situation. My thoughts are with you at this troubling time. Also made a small donation to the BAT (Go Fund Me) page to help keep this enjoyable website going. Big thanks GJ! The only problem is Sharon will be wanting me to be nice to her now and buy her something for the bike. I...I just don't know how to be nice. I'm sure you can think of something to buy. I find most of the blogs interesting. 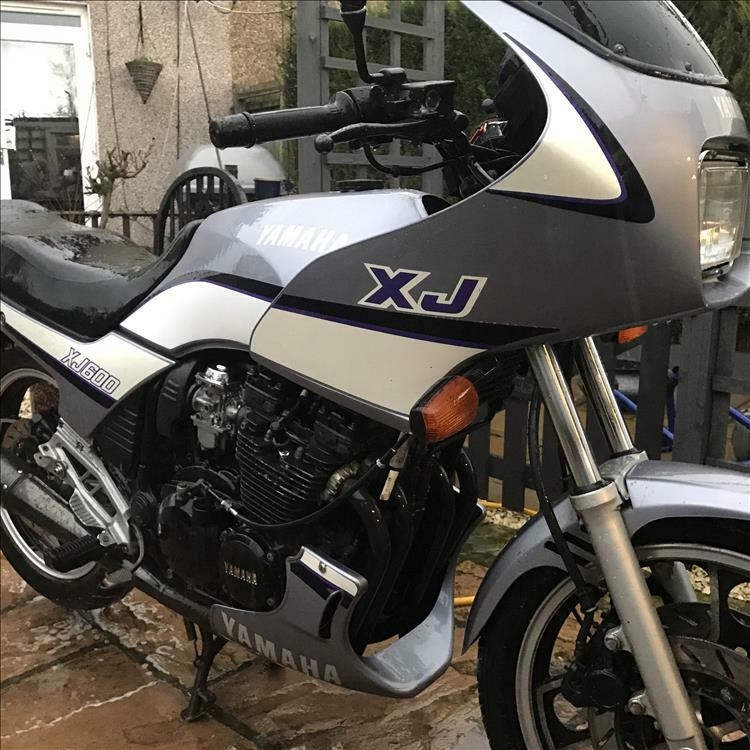 The site has a nice community feel and I only stumbled across it looking for reviews on a Honda CB 125 F. I am a member of a few motorbike forums and this site does not seems to suffer from the usual trolling issues. Could be a case that it's well moderated by the pair of you. But also frequented by bikers with a more mature outlook rather than of a mature age. It's got nothing to do with moderation as yet GJ as we haven't had to pull many posts - so far. I hope it's the contents drawing in readers more concerned about safe motorcycling, riding for pleasure and exploring rather than wheelies and who like to share rather than boast. That said motorcycling should be fun too. Be sure to open that throttle once in a while when it's safe to do so. Your grandkids don't wanna hear stories of how sensible you were as a youth. Just stay safe enough so they can hear the good stories. Good luck to you with your medical problems Sharon. I hope they find a way to help you quickly. Thanks to you all for your well wishes. It is thanks to people like you 125Tony sharing your stories that I know that even with a medical condition I can hopefully continue to ride. I guess this is why I shared my story too. The more we know the more we learn we can achieve things. I know my "Are you are a terrified Leaner" post helped people who may have thought they were the only ones to ever find that riding a motorcycle could be so scary and difficult at first. At present my condition has no known cure. The best I can hope for is to be able to try and manage the symptoms. But it is not stopping me yet so on that note I am leaving you to go get ready for a ride. More miles left in this lumpy girl yet. Well thank you Sharon I'm glad the posts have helped. It's nice to be able to give something back to a website that I've taken so much from myself. I haven't that much experience with other forums but I agree with GJ's comments and pleased I too stumbled across this site early on. Bike therapy sounds pretty good in my books, go you! Good luck with the treatments, Sharon ;-). Ren, I'm gonna keep the pressure on by putting in another contribution - I've read all the BAT articles. It's a very long time since I rode a bike, but the urge is always there :-). Cheers. Big Bro. Hi Sharon, Ren may have shown you a bit of James My son playing guitar who has been hit by a very scary illness (not really sure what he has yet).It put paid to his most recent scheduled trip to America trying to get a record deal. He obviously felt terrible in hospital but, like you will find a way of staying on board your bikes, he kept on playing!! here's some inspiration for you. https://www.youtube.com/watch?v=NSnmeyo2_2k , good luck to you.Chris. Thanks Sharon,I'm sure all the good that people send to James stops him from being down,which should be akin to being positive which is always good. Unfortunately that doesn't stop the people around him, or you ,from worrying for the future.I know you have had problems of your own, and family before. As you say Sharon why am I telling you this ? Keep well and keep blogging ! Kinda puts things into perspective Wayne. I could patronise you with some pleasantries but they won't make a damn bit of difference to what you've been through. Instead I'll ask what I'm really thinking...which 24 year old bike are you working on? You have certainly been through the mill and back again. Like many who have been through very testing times you have learned to be grateful for you have and that is indeed a key to happiness. You are so right that having a passion such as biking keeps us focused and determined to carry on in what ever we may be able. Today when I got home from work I came home to my little house that always makes me feel welcome and I smile. I look out of my french doors to my shed and the motorbikes tucked inside and I smile even more. Today is a good day, no pain for once and I am incredibly happy and grateful for my life and what I have. I am content and that is something never ever to be seen as boring but as a wonderful achievement. Good days like this give me the strength to do battle with the bad ones. May we all have the strength to fight the fight and enjoy another day. 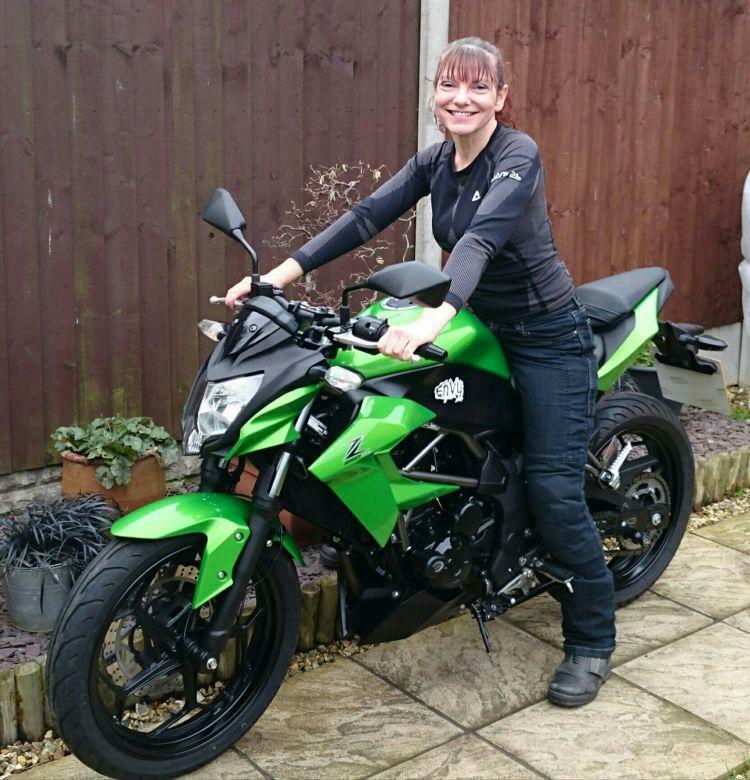 Sharon you seem to have the kind of perspective on life that will always pull you through - not withstanding your bike passion so I suppose we'll both just have to grin and bear it ! ?? While our trials and tribulations grind us down we might as well focus on the things we enjoy - motorcycles. The XJ600, forerunner of the Fazer 600 I once owned. 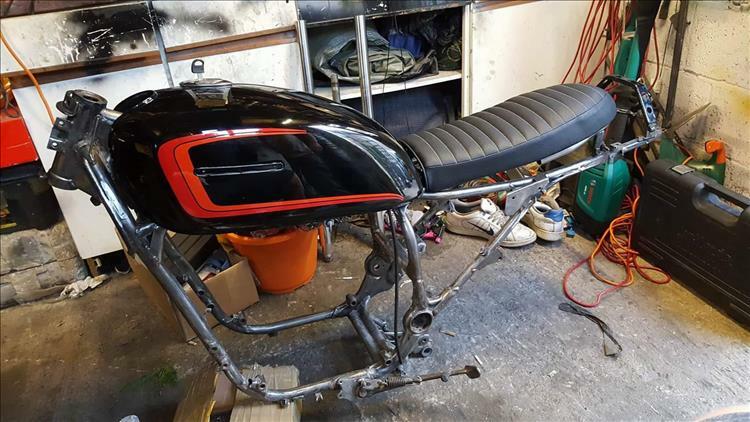 Should be a cracking bike that Wayne when it's done. Do you plan to keep it for some time or sell it on a start another project? XJ 600 as a scrambler? Different, I usually envisage them sort of bikes as singles or twins. Be interested to hear how you get on Wayne.